Striped Lepidagathis is a prostrate herb with 4-angled, softly pubescent twigs. Leaves are carried on 0.4-2.5 cm long stalks. They are ovate lanceshaped or ovate-elliptic to obovate, 3-9 x 1-3 cm, pointed at both ends, margins toothed, velvet-hairy on both sides. 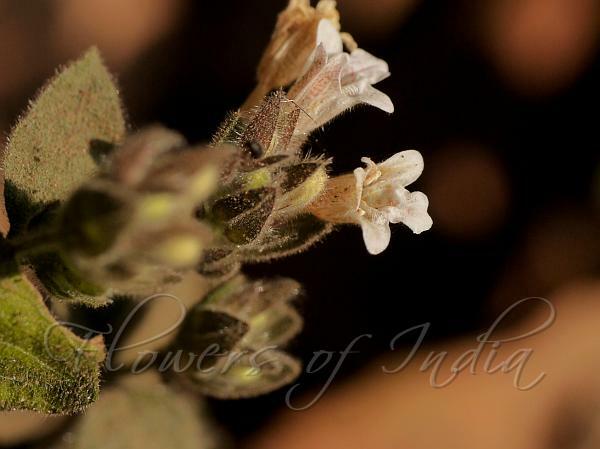 Flowers are white, borne in terminal and axillary, soft hairy, upto 4 cm long spikes. Bracts are ovate or elliptic-ovate, 7-12 x 4-6 mm, 3-nerved, pointed. Bracteoles are ovate-lanceolate, shorter than bracts. Sepal tube is 5-lobed, lobes unequal, not sharp-tipped, softly appressed hairy, outer 2 ovate-lanceolate, longest, inner 2 lobes linear. Flowers are velvet-hairy outside, tube about 4 mm long, upper lip shorter than the lower, 2-lobed, lower lip abount 6 mm long, with 3 obtuse lobes. Stamens included. Ovary globose with c. 4.5 mm long style. Capsule are oblong, about 6 mm long, hairy at the tip, 4-seeded. Seeds somewhat circular, about 1.5 mm across. 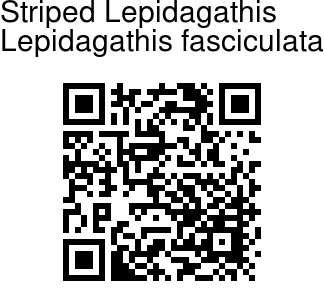 Striped Lepidagathis is found in Pakistan, India, Sri Lanka, Bangla Desh and Burma. Flowering: November-April. Photographed at Jamboti near Belgaum, Karnataka.